Do you like meeting new people? Do you find yourself randomly talking about children’s librarianship topics? Do you want to spread your love of ALSC? 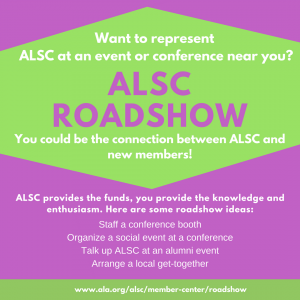 If you answered yes to any of these questions, than an ALSC Roadshow is something you should do! No, that does not mean you will be singing about ALSC on the side of the road (though we all know that children’s librarians are natural performers). 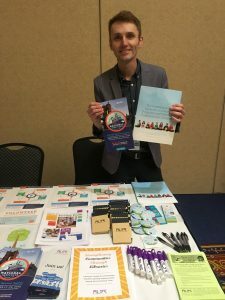 ALSC provides limited funding to members who are interested in staffing booths, presenting programs or coordinating social events at conferences, alumni events, or even local get-togethers! All you need to do is a fill out a request by visiting the roadshow portion of the ALSC website- http://www.ala.org/alsc/member-center/roadshow or filling out the form here. Requests can be for materials only, or for funds for a special event or to cover conference registration! Requestors must be ALSC member and all requests must be submitted at least four weeks prior to the conference. Is the proposal relevant to the work of children’s librarians? How much value does the proposal bring to the organization? Is this an event or conference related to the work of ALSC members? So, what are you waiting for? Spread the love of ALSC throughout your local areas!! Any questions, please contact Elizabeth Serrano, ALSC Membership Marketing Specialist, 800-545-2433 ext 2164.